"Add a splash of Paradise to any dish!" 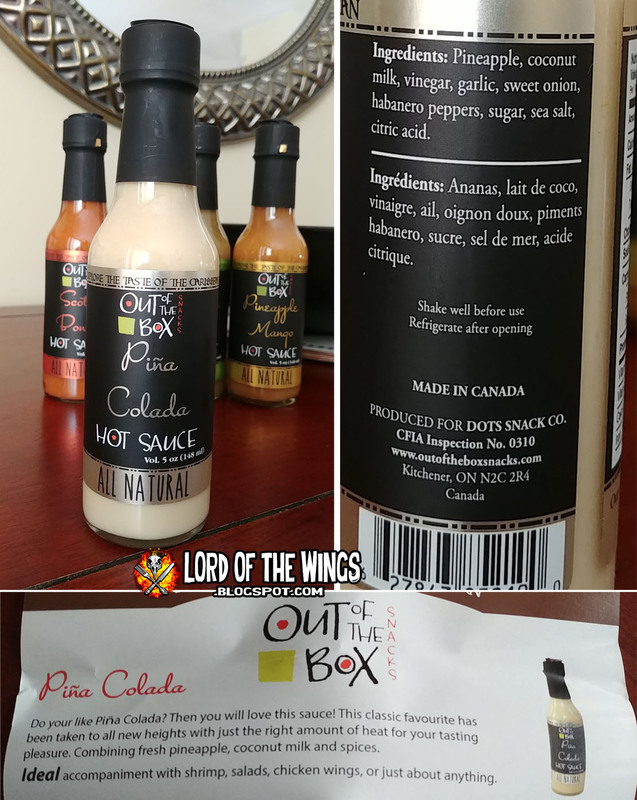 Not too long ago I was contacted by Canadian gourmet hot sauce purveyors Out of the Box Snacks to see if I wanted to try their product. 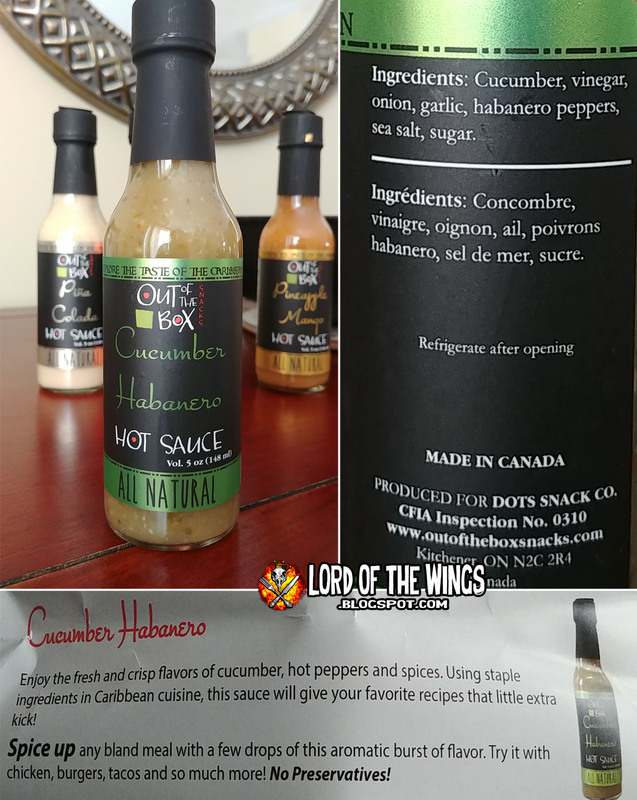 They just won at the Zest Fest 2018 Fiery Food Challenge in Irving Texas - 1st Place for Caribbean Style Hot Sauce for their Scotch Bonnet and 2nd Place for Fruit Based Medium Hot Sauce for their Pina Colada. I love hot sauce and said I'd love to do some sampling. Now for disclosure sake, this was sent to me and I did not pay for it. I am appreciative of the gift sampling, but I should point out that when someone or a business sends me something to review I am going to look at it and review it objectively; I'm going to review it honestly and it may or may not be a favourable report. I'm not being hired to promote the product (and if I was, I would disclose that fact). I just want to be clear up front. About a week later the package arrived - I love getting mail! 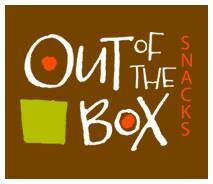 Out of the Box Snacks are based out of Kitchener Ontario - I'm always happy to highlight a Canadian business. 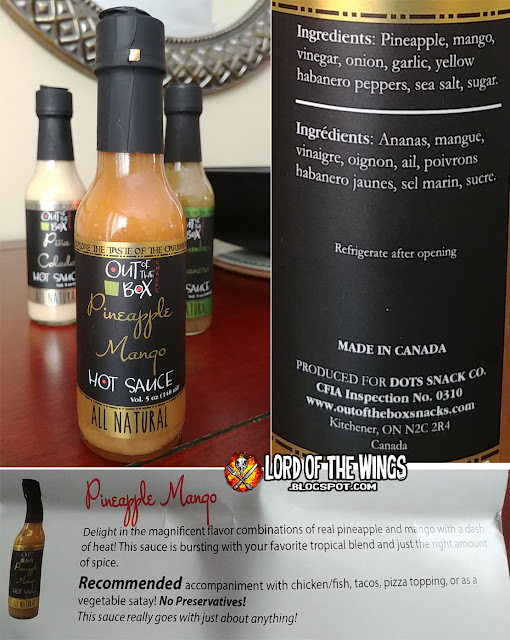 Inside were 4 bottles and a description sheet about these "Inspired by the Caribbean" sauces. They promote the fact that the sauces are vegan and gluten free with no artificial colours, thickening agents or preservatives. They sent me 4 sauces: Pina Colada, Scotch Bonnet, Cucumber Habanero, and Pineapple Mango. I loved the rainbow of colours. The labeling is simple, but still conveys that 'gourmet' sauce feeling, especially with the 'black label' cap on the top. Searching online they retail for about $10 a bottle. This sauce piqued my interest the most because it sounds so unique. I've never had a pina colada hot sauce before; have you? I imagined it would be sweet and soothing. 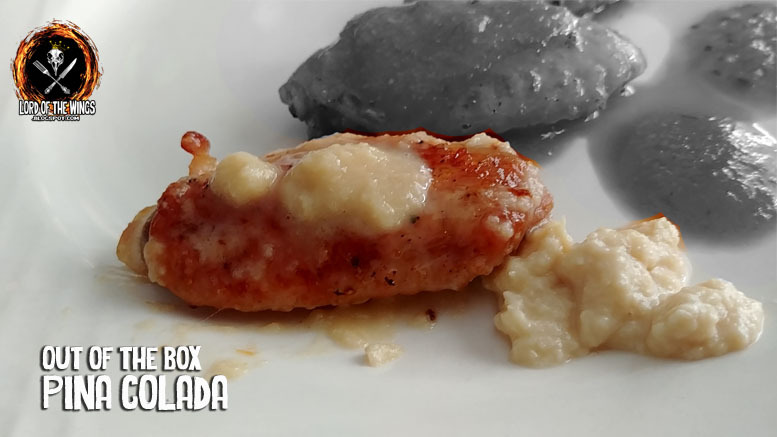 They also recommend it for chicken wings, so perfect right? I loved the colour of this sauce, but I won't lie, scotch bonnet hot sauces are not always my favourite. I often find they have a good heat, but are sometimes a bit too fruity flavoured for my liking. But the colour really made me feel that this was a good hot sauce. I didn't know what to think of this sauce - I mean habanero is good, but cucumber in a hot sauce? I loved that from the bottle you could see all sorts of seeds and spices floating around. I'm going in very skeptical of this because, well, cucumber. Ok this one would be sweet for sure. I love pineapple and mango, so this could be good. 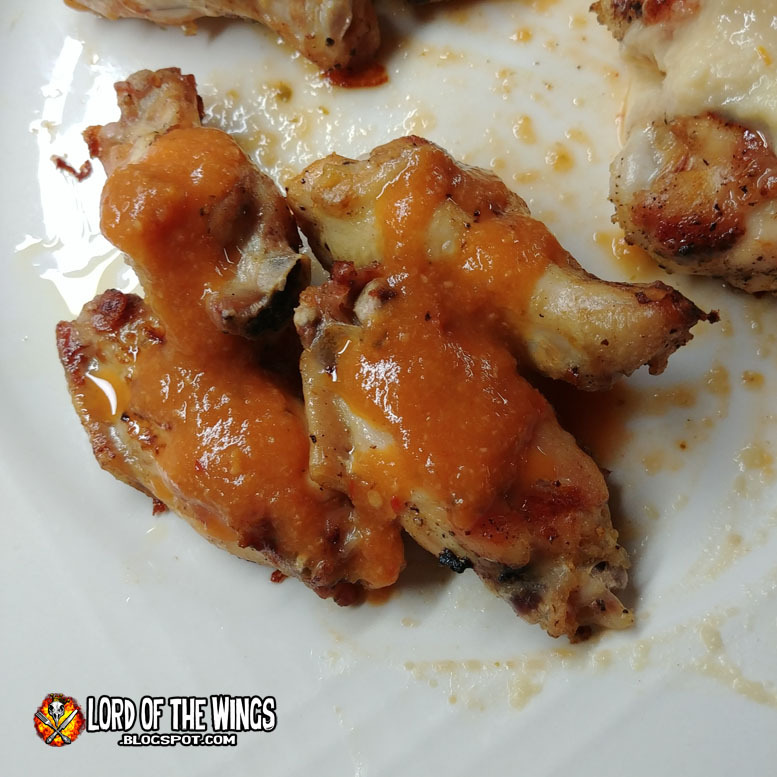 I went out and cooked a bunch of wings on a BBQ Grill - I felt that the grill flavour of the chicken would be best to highlight the sauce mix. 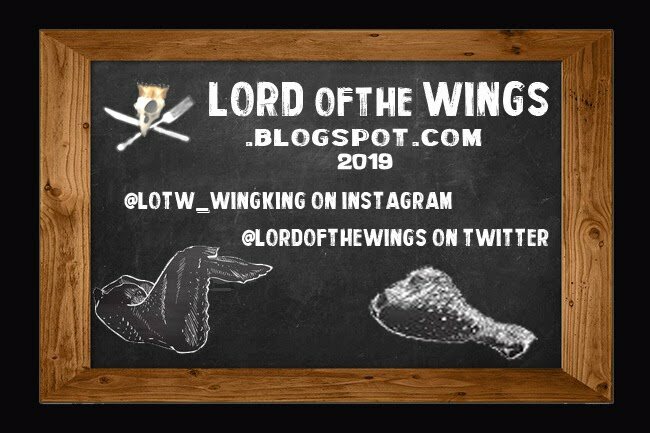 I did season the wings with salt and pepper and tossed them in olive oil. 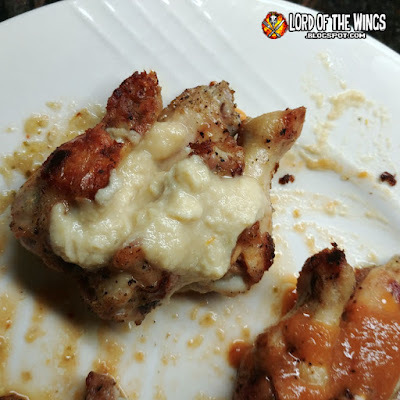 For my samplings, I put a few dabs of sauce on the plate just for a sauce visual and tasting. 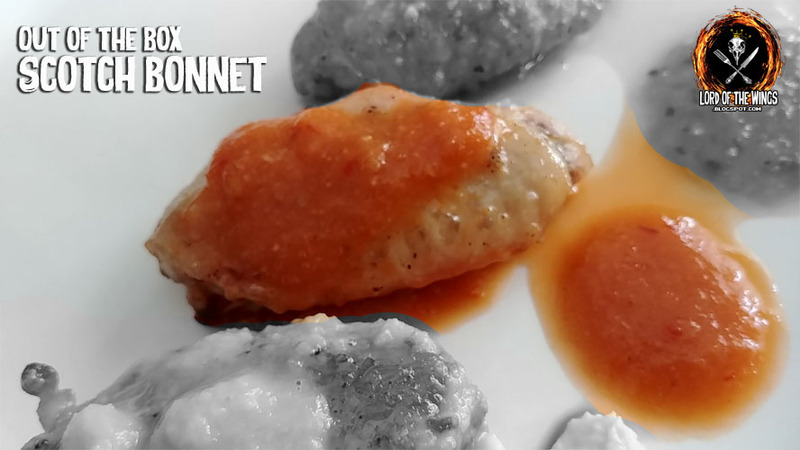 Each sauce had its own distinct look, colour, and texture. Separately I tossed a wing in each sauce and re-dabbed for extra sauce. I started on the right with the Pineapple Mango and made my way left. 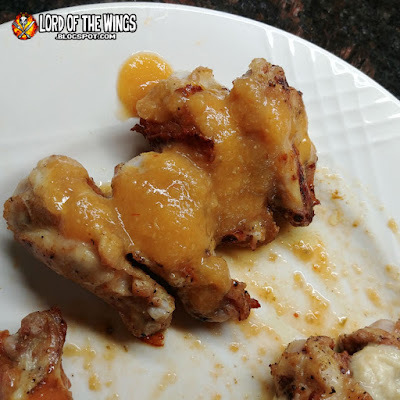 I tasted the sauce first, then I tried each wing. I would take a drink and cleanse my palate, then move on to the next sauce. Right off the bat, the mango-pineapple flavour is very clearly there. But you can also taste onion and garlic. It's sweet with heat, and also a little salt. Flavour-wise it went well with the grilled wing. Heat-wise, it created a burn in the back of the mouth. It was a very palatable heat that just about anyone would enjoy. 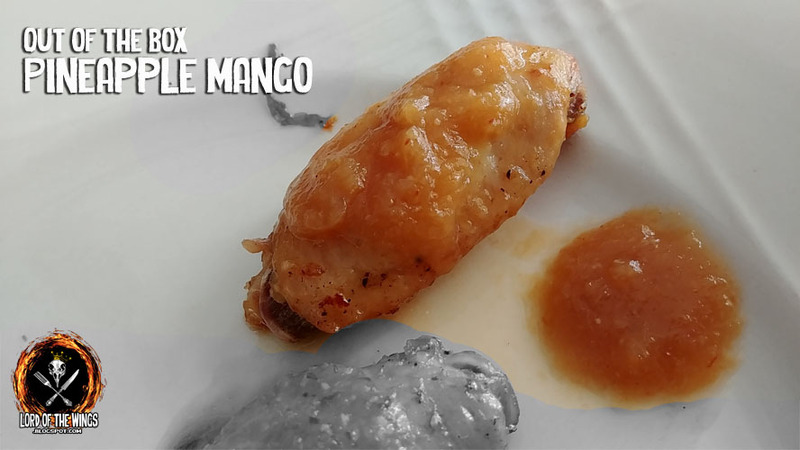 The sauce itself is slightly runny but also mushy with real fruit. I quite liked this sauce and could see myself eating it on pork dishes especially. I don't know what to say about this sauce. It tastes like cucumber, like a slightly spicy cucumber. It tastes 'watery' like a cucumber. The habanero is in the background and the cucumber is clearly in the foreground and is keeping the habanero cool. You can taste the garlic and salt too. This is a very runny, wet hot sauce. The heat level is also really low on this but it does taste very fresh. I didn't like or dislike this sauce - I just don't know how I would apply this. If you love cucumber, and cucumber and I are only acquaintances, you might like this. That being said, my wife loved this sauce and put this on everything everyday since it came. It had a great flavour - little sweet, but lots of onion and garlic flavour. The heat was there in my first sampling, but it built up. Went really well with the wings from the grill. The sauce itself is not too runny but not too thick either. Did I mention the heat built? And the sting really went to the tongue. This is not for the faint of heat, but chili-heads won't find it atomic. For me it was just a nice burn. 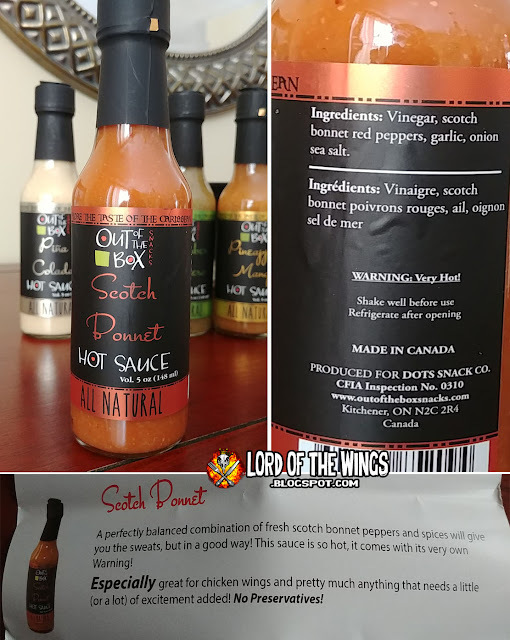 This was probably the best scotch bonnet sauce I've ever had, I think because it wasn't as sharp fruity as other sauces are, but brought that savoury garlic/salty-ness that made it enduring. I saved this sauce for last because I thought it would be a good cooling sauce after the scotch bonnet burn. What you don't expect is that this sauce comes with it's own bite. I mean I knew it was a hot sauce, but I didn't think it was a hot sauce. I was expecting just a creamy sauce. This sauce is very thick - like it didn't want to come out of the bottle without a skewer to coax it out. It looks like horseradish sauce - there's even little stringy fibres inside. My first taste it was clear this was pina colada. That coconut and pineapple is right there. But there's also a kick I wasn't expecting. 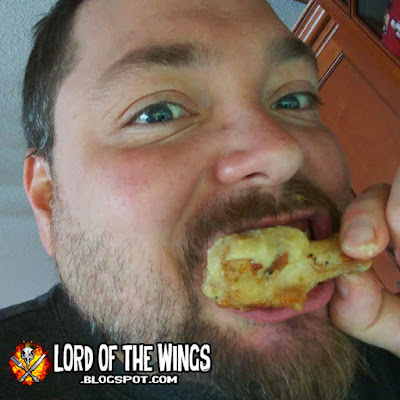 It's very mild, but that little bite comes through all the creamy sweetness. It's so unique, and quite tasty. If you were wondering what this would go with aside from wings, we had some leftover Thai food another night and this sauce paired well with it. 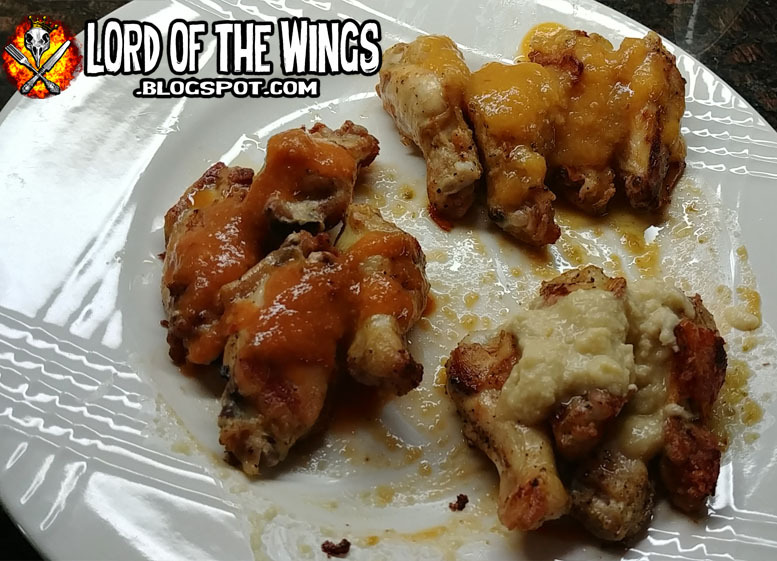 After the samplings, I did some larger batches of wings with the sauces tossed. I didn't use the Cucumber Habanero because I wasn't crazy about it and decided to up my wing resources for the other sauces I did really like. 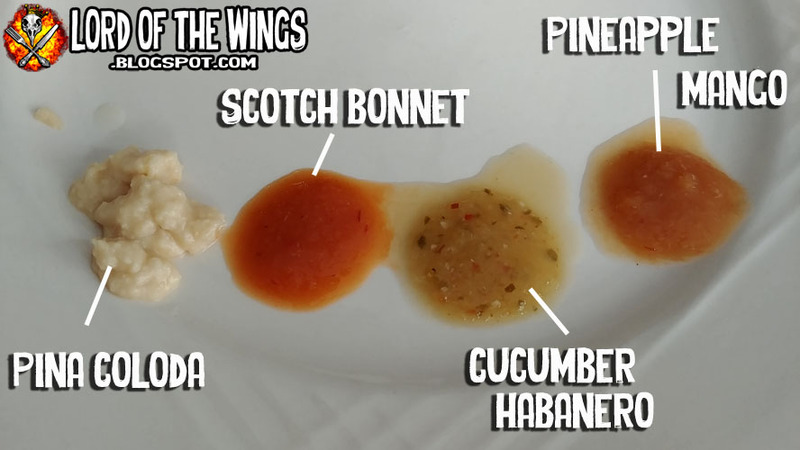 The Scotch Bonnet was just an all around good hot sauce. It had a really good flavour and a good heat and I can see myself using this on any number of dishes for hot sauce, but I think wings would be the best. The Pina colada is novel and tasty. You get the coconut flavour. This would be the sauce that stood out the most for me from when I saw the bottles to after tasting. 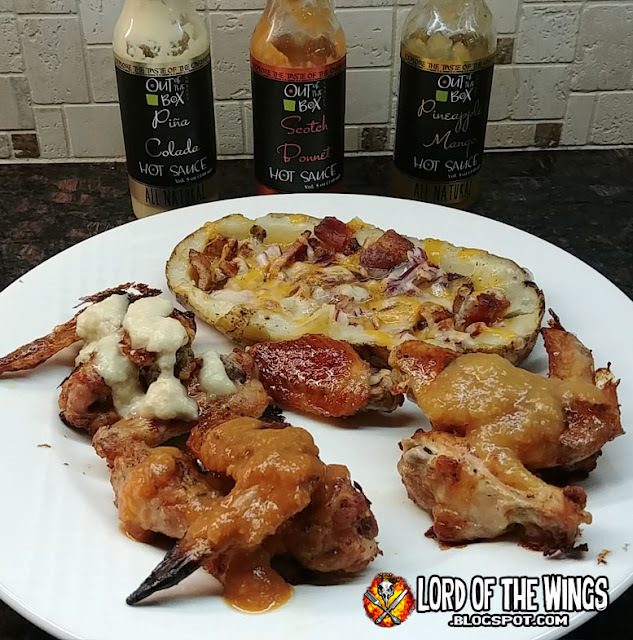 Now I don't think I would make a whole batch of wings just Pina Colada - I think this sauce works on that novelty factor on its own, but is best paired with the other sauces. These sauces don't taste like big batch commercial hot sauces - they tasty personal and unique. They each had their own flavour and felt like they were made with love. I mentioned that to Dots Khadim, owner of Out of the Box Snacks. Dots, who is originally from Guyana, said "I love to cook for family and friends. I have been making hot sauces for my family, and everyone love my sauces. This is what inspired me to experiment with different flavors and Caribbean Exotic fruits." 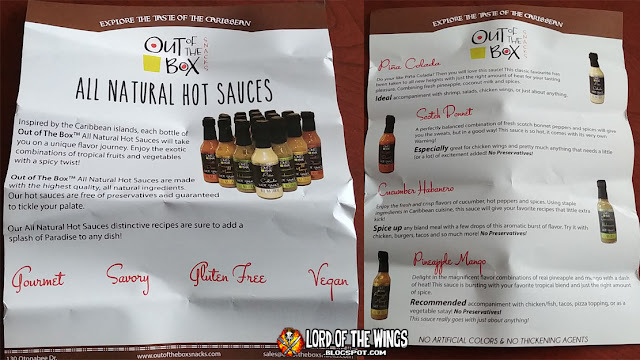 If you are looking for some gourmet hot sauces that aren't like the others, Out of the Box Snacks Hot Sauces are for you. Savoury heat? Try the Scotch Bonnet. Fruity bite? Pineapple Mango. 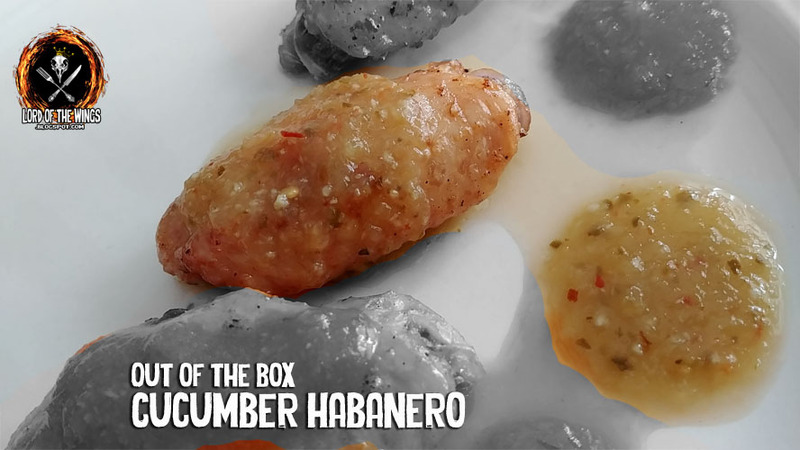 And for truly thinking 'outside' of the box, Cucumber Habanero for a fresh taste, or Pina Colada for that completely unexpected hot sauce. 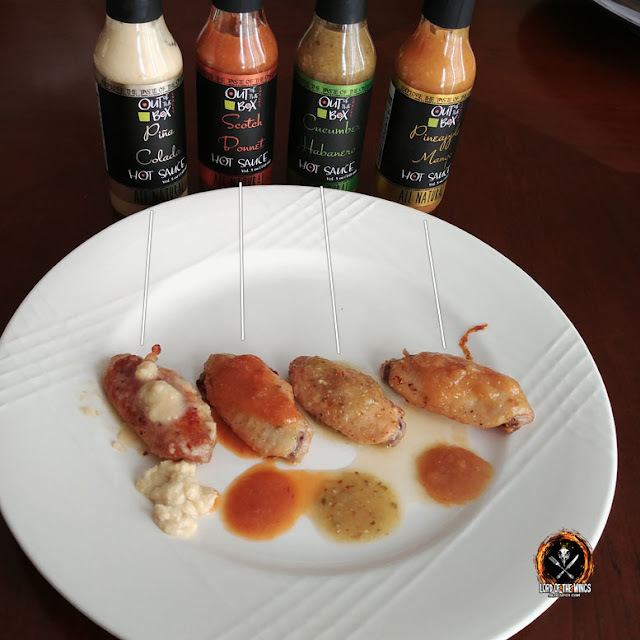 I really enjoyed the flavours of these sauces and think you will too. 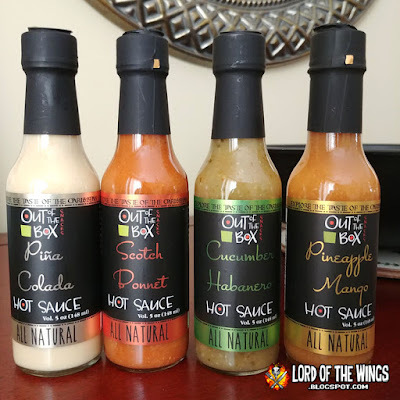 Awesome review of each sauce! The Cucumber Habanero goes really well as topping for burgers, tacos, eggs, even on salads! @anonymous - thanks for stopping in, taking time to post, and for the compliments. They are great sauces & thanks for sharing great uses for the Cucumber Habanero!! !